Apple is now offering the special deals for its customers worldwide and selling its best iPod Touch 4th Gen. with Retina Display and integrated A4 chipset processor in Cheap Price of just $129 for 8GB storage. So if you want to experience the power of Apple iOS mobile operating system than you can get your hands on it in Cheap Price and with the Saving of $50.00 dollars and 27% Off on actual price of iPod 4G Touch devices. Apple iPod Touch 5G is already launched in market but it’s very expensive to purchase it but if anyone wants to purchase slightly older iOS device in discounted cheap price of almost 27% off than you may consider it from Apple Store. Apple iPod 4G Touch devices is quite handy for Audio, Video, Applications and Gaming experience with the power of iOS. 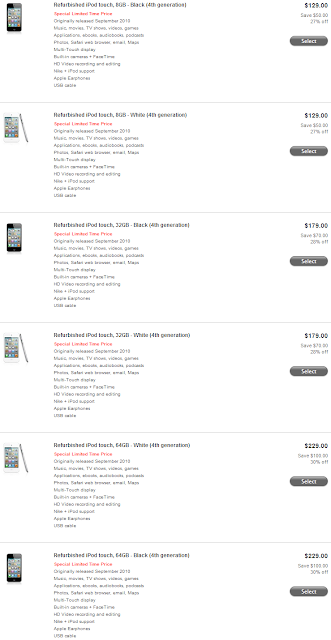 Users will not only get a device in cheap price but will also get usual one year standard Apple warranty. So what you're waiting for? Buy Apple iPod 4G Touch with Retina Display and A4 Processor for $129 in Cheap Price from Apple Store with $50 saving and 27% off. The special offer is limited so you have to get it now. Not only this Apple is also offering Refurbished iPod 4G Touch with 8GB storage in Black and White color for just $129.00 with Saving of $50 and 27% Off on actual price. 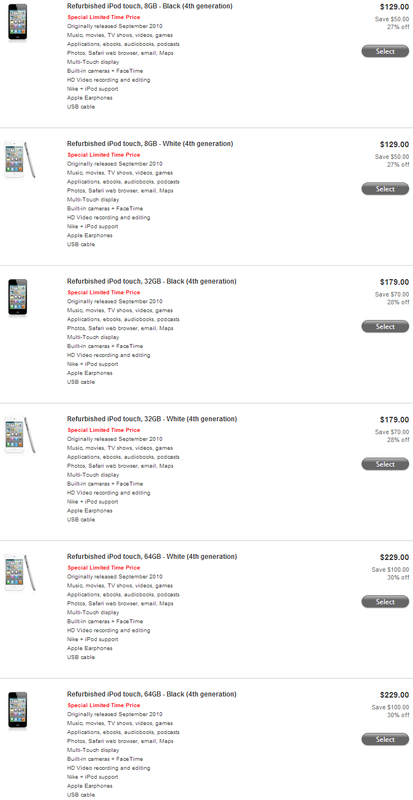 Apple is also selling Refurbished iPod 4G Touch with 32GB storage in Black and White color for just $179.00 with Saving of $70 and 28% Off on actual price. 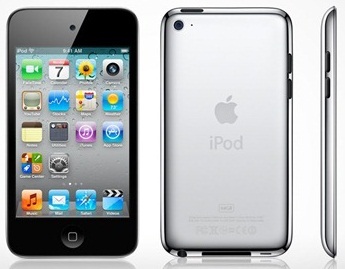 Apple is also offering Refurbished iPod 4G Touch with 64GB storage in Black and White color for just $229.00 with Saving of $100 and 30% Off on actual price. These offers are limited for a short period of time, so you have to Get & Grab Apple iPod Touch 4G in Cheap Price now from Apple Store to make the most off it. For full config and specs of Refurbished Apple iPod Touch 4th Gen. (8//32/64 GB) Click here.